Special is valid from 20th September 2018 to 30th June 2019. PLUS………Concierge, Suite & Haven receive all! *Conditions Apply: Prices are per person, capacity controlled and listed in Australian dollars twin share including port taxes. Prices may fluctuate if surcharges, fees, taxes or currency change, and may be withdrawn at any time. Prices shown here are not shown in real time. While we endeavour to keep our pricing as up-to-date as possible, the advertised prices shown here may differ from the live prices in our booking system. The prices shown are for a cash payment. Credit card fees of up to 2.5% will apply. Offer correct as at 21Mar19 and subject to live availability at time of booking. Prices are per person twin share based on best available cruise fare, inclusive of all discounts unless otherwise stated. All offers are capacity controlled and can be withdrawn or modified at any time without notice and subject to availability at time of booking. Outside and Balcony cabins may have obstructed views and Suite cabins comprises Junior Suites, Mini Suites and any other type of suite that represents the best value for each cruise. Unless otherwise stated, all packages containing airfare will require full airfare and taxes within 24 hours of reservation and cancellation/amendment conditions apply. Air taxes are included in package price and are subject to change depending on departure city. Onboard gratuities are included and may not be removed from pricing. ~Specialty restaurants may incur a surcharge. Cabins are based on guarantee and cabin number will not be assigned until documentation or embarkation. +Hotels in certain cities must charge local government tax directly to guests upon checkout which cannot be collected in advance by our agency. All passports, vaccinations and visas are the responsibility of the travelling guest to secure prior to departure from Australia. Some cruise lines reserve the right to impose a fuel levy if the NMEX price reaches a certain level - please check with your consultant at time of booking. Cruise deposit, amendment and cancellation conditions apply. Travel agent service fees not included. Special conditions apply - please ask for full details at time of enquiry. Offer ends 30Jun19 or until sold out/withdrawn from sale. Please note only residents with an Australian address are eligible to book Australian rates in Australian dollars. This cruise package is provided by Seven Oceans Cruising, please ask your travel agent to contact us for more information. ^^Norwegian Free At Sea terms and conditions can be found at https://www.ncl.com/au/en/ cruise-deals/choice-int. 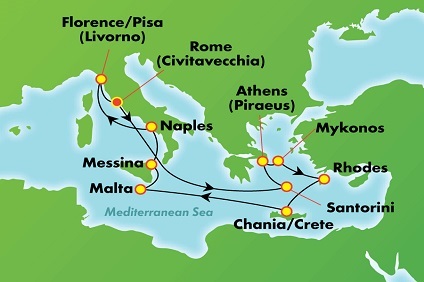 11 Night Cruise sailing from Rome roundtrip aboard Norwegian Jade. Your dream holiday is waiting on the Norwegian Jade. Sail on a Mediterranean cruise and explore castles, cathedrals, romantic islands and sophisticated cities of Europe. Or toss your schedule to the breeze on a Caribbean Cruise and bask on pristine beaches while enjoying island cocktails. As you cruise from port to port along stunning coastlines, we'll keep you entertained day and night with exciting nightclubs, award-winning restaurants, a grand casino, swimming pools, a pampering spa and so much more. There's tons of fun for kids too, so bring the whole family and enjoy the adventure of a lifetime. Endless adventures await in Rome. With two and a half thousand years of history, art and culture, it is no wonder Rome is one of the most visited cities on the planet. Gaze at the masterpieces of the Vatican or walk into the past with visits to ancient relics, historic monuments and legendary museums. Or people-watch while sipping on an espresso in a quaint cafe. Whitewashed villages clinging to the sides of the sea cliffs have made the volcanic island of Santorini one of the most widely photographed places in the world. The island's charm and subtle mystery have even made it a target of speculation as the location of the lost city of Atlantis. This is the cradle of civilization, the oldest city in Europe. Not only is this city home to the Acropolis and some of the most important architectural structures and archaeological finds in the Western world, It is also a very modern city, an urban amalgam of extraordinary art, culture, cuisine and shopping. Mykonos is a classic Greek Island with whitewashed houses, blue-domed churches and windmills. Add a reputation for beautiful beaches and you'll understand why Mykonos is the most popular island in the Cyclades. Explore the island in a 4 x 4 or take a ferry to the tiny island of Delos. This Greek island just off the coast of Turkey exudes beauty and history. Take a walking tour of the old fortified city and stand in awe of the impressive Grand Master's Palace. See where the Colossus of Rhodes, a onetime Wonder of the World, once stood and savour the charm of this remarkable walled town. Along the scenic coast lies the whitewashed town of Lindos with its ancient acropolis and stunning views. One of the most beautiful cities on the island of Crete, charming Chania has also been the site of many great battles. Greeks, Christians, Moors, Venetians and Ottomans all fought for control of the city. See how these cultures interweave when you explore Old Town, with its Venetian Harbour, 16th-century Turkish prison, 17th-century mosque, Greek Orthodox Chania Cathedral and more. Although somewhat scarred by World War II, Valletta prides itself on its magnificent Baroque palaces, piazzas, gardens and churches. The Magisterial Palace, built between 1571 and 1574, now houses the Maltese Parliament and offices of the President of Malta. The third largest city on the island of Sicily, Messina welcomes cruise ship visitors with its lovely harbour, extraordinary architecture (much of which miraculously survived a horrendous earthquake and tidal wave in 1908) and wonderful food. Stroll through Messina's Piazza Cairoli taking in magnificent fountains and cathedrals, or sip Marsala wine at a sidewalk cafe. Cruise to Naples, located on Italy's stunning Amalfi coast, a city rich in history. A tour around Naples' grand piazzas, cathedrals and castles in the old centre will take you back centuries. Pompeii is not too far either, a dashing city which boasts diverse cultural offerings and charming streets. How lucky to visit the Tuscan region, Florence & Pisa, resplendent in art and history. What's even more fortunate is that all the main attractions in Florence are centrally located for the perfect walking tour. See Santa Croce, Piazza del Duomo and Michelangelo's David.